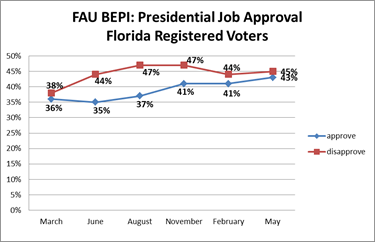 A new FAU BEPI survey finds President Trump with his highest approval rating in Florida since taking office at 43% and his disapproval rating came in at 45%. When asked specifically about the Trump administrations Tax Cut Legislation, 29% said it has helped them financially while 19% said it has hurt them. A majority, 52% said it has made no difference to them financially. However when asked who voters would rather have as President 49% said Mr. Obama and 43% said they rather have Mr. Trump. The potential US Senate Election in Florida found Governor Rick Scott with a slight lead over Senator Bill Nelson 44% to 40%, 16% were undecided. Among very likely voters, the ballot test is tied at 45% apiece. There are two lead candidates in both the Republican and Democratic Primaries for Governor. 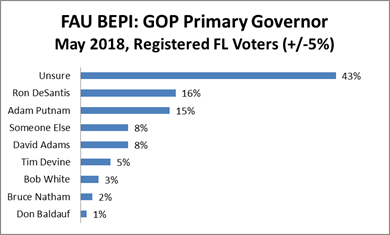 In the Republican field, Ron DeSantis (16%) and Adam Putnam (15%) lead the way with no other candidate in double digits. 43% of GOP primary voters are undecided. The Democratic field is similarly tight with Philip Levine at 16%, Gwen Graham at 15% and Christopher King rounds out the top three at 10%. 42% of Democratic primary voters are undecided. 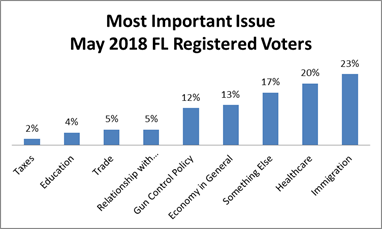 The most important issues for voters are immigration (23%) and healthcare (20%). The economy in general was ranked third at 13% and Gun Control Policy rounded out the top four at 12%. This survey was conducted using an online sample supplied by Survey Sampling International (n=500) and via an automated telephone platform (IVR) using registered voter landline phone lists supplied by Aristotle, Inc. (n=500) for a total sample size of n=1,000 registered voters with a margin of error of +/- 3 percentage points. Data was collected May 4-May 7, 2018. 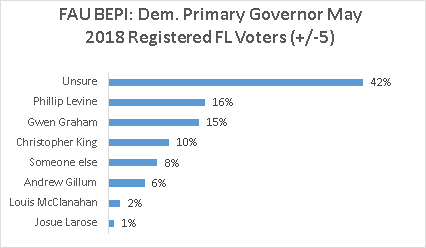 Responses for the entire sample were weighted to reflect the statewide distribution of the Florida voting population by gender, party affiliation, ethnicity and region.